When horses sweat they lose water and electrolytes, which are essential for normal cellular function in the horse. These electrolytes can be replaced by giving oral electrolyte solutions. Research has proven that giving horses high quality electrolytes during & prior to hard work can prolong the length of time it takes horses to get tired by 23%, ie they can work for 23% longer until they get tired. Therefore giving electrolytes could have a positive impact on performance. Horses who are given electrolytes within an hour of finishing work, have also been shown to recover better. Vetidral is an excellent electrolyte supplement because, as well as containing electrolytes in the identical proportion to those lost in sweat, it also has prebiotics, which stimulate electrolyte replacement & absorption. 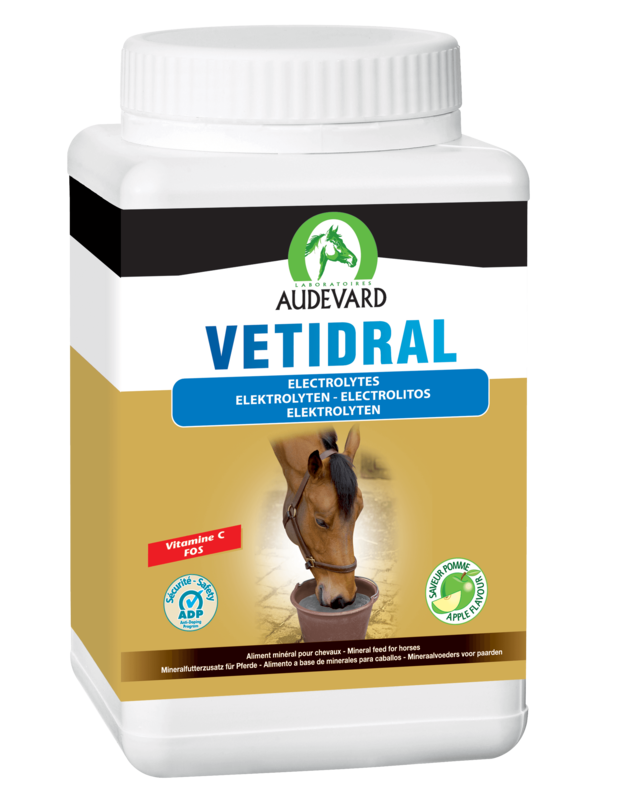 Vetidral comes as a powder or liquid, to be given in feed, and as a syringe paste (Vetidral Flash), which is ideal for use when away from home at competitions. Feeding Instructions- Give 50g daily (can give up to 100g in very hot weather, or after particularly intense exercise), around the time of competition. Ensure water is always available. 1.5kg will last for up to 30 days.